Pacific herring populations in Port Gamble Bay have dropped dramatically in recent years, and the Port Gamble S’Klallam Tribe and state agencies want to know if contaminated sediment is to blame. The bay was home to a sawmill for nearly 150 years. Creosote pilings, wood waste and polluted stormwater runoff were the site’s legacies until the area was cleaned up in 2015-2017. Prior to the cleanup, the tribe and state conducted a baseline study that documented high levels of contamination in herring embryos around the Port Gamble Bay mill site. 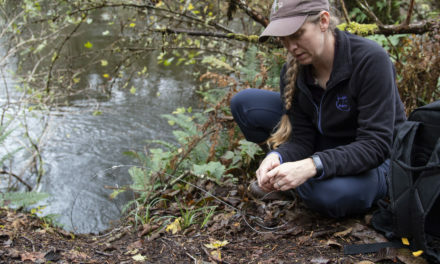 Funded by the state Department of Ecology, the tribe and state Fish and Wildlife Department (WDFW) are following up with a study of the levels of contamination in the sediment relative to the contamination levels found in herring embryos since the cleanup. In April, WDFW deployed herring embryo cages in five areas in the bay for approximately 10 days and is analyzing the eggs’ contamination levels. After the cages were removed, the tribe took sediment samples from the same locations to test for dioxins and other chemicals.